I have seen the occasional hide marketed as rug, throw, blanket and car seat cover. But never have I seen Cowhide Merchandising at IKEA in such a selection, with IKEA® store fixtures for formal drape and presentation. Maybe present trends in sustainability have an undercurrent of a return to natural materials like cow hide. Is this a good thing overall, or do you think PETA would protest if they knew? 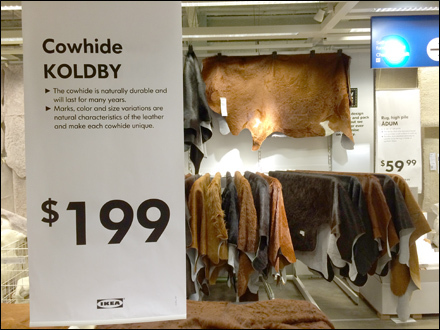 Click through the Cowhide Merchandising at IKEA slideshow gallery for various views, and pick your hide. See that the “Hero” cowhide is held in prominent position by Spring Clamps.